WHAT IS YOUR FAVOURITE BOX AND WHY? My favourite is a jewellery box we created for Tateossian. For me it’s the crème de la crème of boxes; the material, the stitching, the contrast detail, and the silver plate, are all additional details that help make it extra-special. It’s very subtle, but those little touches are what makes it stand out. WHAT DO YOU THINK IS THE KEY TO A QUALITY BOX? It’s something that’s hard to put your finger on – sometimes less is more and the simplest boxes can be the most striking. A design that’s been well wrapped, with a high quality paper will always have a certain something. By adding a colour accent or detail to a plain box you can simply and effectively lift its appearance to another level, as well as tie it in with your branding. HOW DO YOU GO ABOUT BUILDING A BOX SPECIFICATION? To use an analogy, developing a jewellery box is similar to building a specification for a luxury car. You always start with the core and the basic shape, then you can start adding the details: the outer wrapping, the trim, the interior, print, foiling or embossing, then stitching and finally the hinge or closure details. There are so many ways to personalise it for your brand depending on your budget. That’s what’s so exciting; the options are almost limitless. 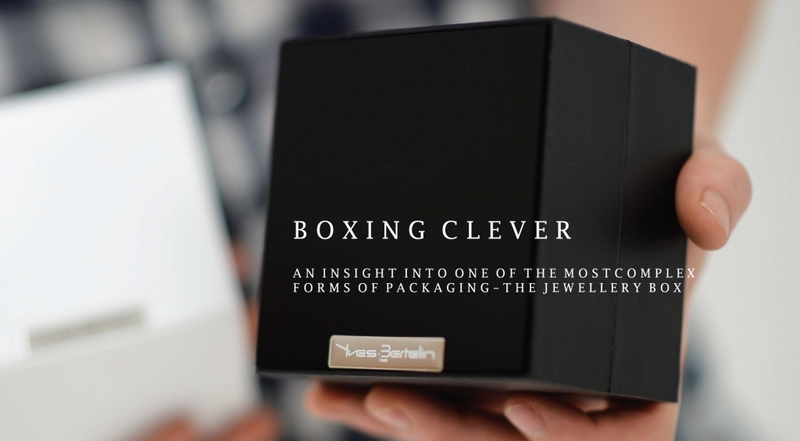 WHY IS THE BOX SO IMPORTANT IN JEWELLERY? Consumers have an expectation of how a product should be presented, based on the perceived status of the brand. It’s vital the experience created by the packaging lives up to these expectations. It’s an emotional connection that the touch and feel of the box can help create before they even reach the jewellery itself. WHAT DO YOU THINK MAKES A QUALITY BOX? Aside from the obvious material and design elements, it’s vital that construction and wrapping are to the very highest standard. We pride ourselves on having developed a supply base that provides these unique skills. Creating a fine jewellery box is an artisan profession, taking highly experienced and trained technicians to do it really well. A poorly wrapped box will stand out a mile for all the wrong reasons, but done well even the simplest of boxes will have a luxurious, premium feel. Starting with your basic shape or core, there are generally four types; card, plastic, mdf and wood, depending on the quantity you need, the available moulds and of course cost. The range is vast, including papers, bonded leather or leatherette, as well as specially made box coverings from jewellery box paper suppliers like Winters or Fifield. Made from card core, plastic or foam, and covered with a lining material to match the box, you can choose from a range of standard styles or create your own. The vast majority of jewellery boxes are made with a magnetic snap closure with varying degrees of ‘snap’, depending on your preference! Add satin or grosgrain ribbon tabs to the lids of hinged boxes, or like these, an etched chrome plate and hand-stitching create an eye-catching detail. Hot-foiling, print, embossing or de-bossing, add interest to any text or logo.